Hello, Bro! 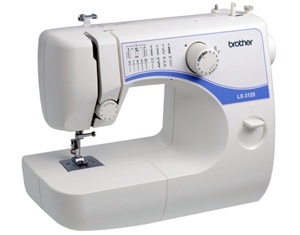 Please meet my sewing machine, Brother LX-3125, aka Bro. Bro was given to me by my mom a couple of years ago for Christmas. Unfortunately, Bro and I never got to know one another outside of the box, since moving and having him in storage kept us apart. Well, I decided recently that Bro and I should try to get over our estrangement and start anew. So, I dragged him out this past weekend and toiled over the directions. Which were terribly written, I must add. Geez! Anyways, I was able to figure out the basics and got him loaded up with thread. I had some scrap fabric laying around, so I practiced my stitches for a bit and finally made a ditty bag for my knitting. Basically its a small pillow case with some ribbon attached to tie up the top, but still! My first machine sewn item! I need to practice a little more, so I might try to make some decorative pillows or something. Once I am comfortable with making straight seams, I am hoping to move on to making a skirt for a vanity that I have. I really would like to get to the point where I might be able to make some simple items of clothing. Sundresses or something?? Who knows. Maybe I’m getting ahead of myself. But a girl can dream big, right? Wish me luck on my new crafting adventure!